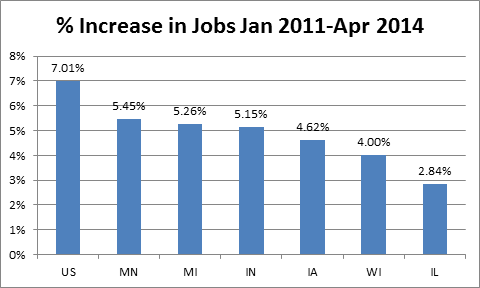 Wisconsin has had less success reducing unemployment than surrounding states. Why? By now, it is clear Wisconsin will fall far short of the 250,000 new private sector jobs promised by Governor Scott Walker during his campaign for the governorship. As of April, the increase is around 113,000. If Wisconsin’s private sector jobs increase at the average rate of the past twelve months the state will fall about 100,000 short of the goal. % Increase in Jobs Jan 2011-Apr 2014. An argument can be made that the promise was never realistic–that a better measure of success would be to compare Wisconsin with the average state, particularly neighboring states. But here, too, Wisconsin falls short. As can be seen in the first graph, Wisconsin’s job growth of 4 percent falls well below the U.S. increase of about 7 percent and below all but one neighboring state — Illinois. That state’s economic difficulties are generally blamed on its public pension problems; Wisconsin, by contrast, is considered one of the best funded pension systems. Given the weak numbers for job creation, the governor and defenders of his policies often turn to the unemployment rate, pointing out that Wisconsin is below the national average in this category. But, Wisconsin’s rate was well below the national average when Walker entered office. Since then, the gap between Wisconsin’s rate and the nation’s has actually narrowed. When Walker took office, Wisconsin’s unemployment rate was 1.4 points below the nation’s; but the gap has gradually narrowed since then to just 0.5 points. The most scholarly of the sites is the Wisconsin Policy Research Institute with its Wisconsin Interest journal. But a recently published article by Tom Hefty and John Torinus on the Wisconsin economy did not address the jobs shortfall. Nothing else on the site was relevant to the issue. I next turned to the MacIver Institute, which describes itself as “a Wisconsin-based think tank” that “will produce a new generation of ideas to make Wisconsin great again.” This suggests it has intellectual ambitions that go beyond cranking out propaganda. I mainly searched on two tabs, one entitled “It’s Working Wisconsin” and the other “Research,” back to October 24, 2001. 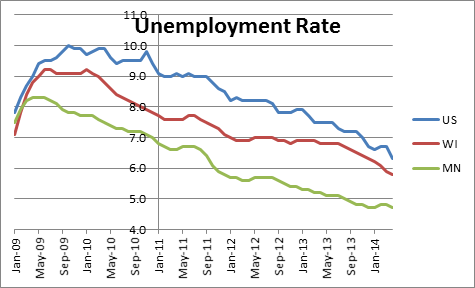 Again I found no discussion of Wisconsin job growth. The other conservative web sites were even less productive. Apparently there is a consensus that the way to deal with bad news is to avoid talking about it, rather than face it and learn from it. 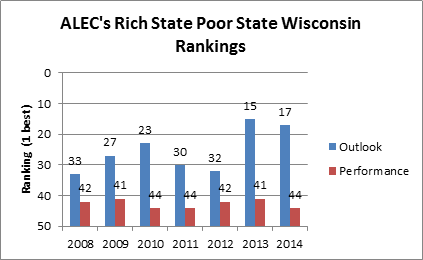 ALEC’s Rich State Poor State Wisconsin Rankings. In the 2014 report, the news was not so good. Wisconsin fell backwards on both rankings. So MacIver simply let this update pass without comment. It seems likely that the apparent improvement in the 2013 Performance ranking that stirred MacIver’s enthusiasm was simply statistical noise. Why the improved Outlook rank didn’t lead to improved Performance is another topic unaddressed. Thirty years ago, conservative think tanks did some actual thinking, notably about ways to use market forces to attack society’s problems. Several of their ideas have since gone mainstream, including the use of pollution taxes and an individual mandate to overcome adverse selection in the health insurance market. But recently these think tanks have fallen on hard times intellectually even as they prospered financially. Models explaining how things work are useful things for imposing some order on an often chaotic and complex reality. But it is way too easy for interesting models to turn into rigid ideologies, immune to evidence or testing. Nowhere is this more evident than in the reaction—or rather the lack of reaction–to the poor employment results in Wisconsin. Wisconsin and the USA has been shedding production type jobs that all service jobs depend on for survival for decades, and the losses fueled by tax policies that came out of the 1980s and increased competition worldwide. During the last downturn, Wisconsin lost multiple paper mills, two remaining car manufacturing plants in Kenosha and Janesville and they have not been replaced by anything that resembles equivalent jobs. We can go down the list of companies that have closed up shop or are a ghost image of the former plants: Allis Charmers, Allen Bradley (Rockwell), Caterpillar, Perfex, Nordberg, Louis Allis, Babcock and Wilcox, General Electric, Kearny Trecker, Milwaukee Road, GM, Chrysler, American Motors, and the Menomonee Valley held 50,000 manufacturing jobs at one time, and now about 7,000. At the end of WWII, the USA held 60% of the planet’s economy as most competition was wiped out. Today, the USA holds 18% of the world’s economy and is in contraction, and China at 18% on the upswing. The USA is 5% of the planet’s population and consumes 40% of the available energy. There are many resource constraints facing the USA today that are rarely discussed by state and national political leaders. Labor production jobs were plentiful in the past with a family purchasing power reaching a peak in 1968-69 and on the decline since that time period. There is a law of economics that a region has to have a balance of 1/3 production jobs to maintain the other 2/3 of the service jobs in consulting, government, retail, restaurant, healthcare, etc. to remain viable. Coming out of the last economic downturn, I have not seen any public discussion, news print, or the political arena on detailed analysis on potential solutions and an overall vision and strategy. It is as if we just plod along and hope it goes away, leave the mess for the next guy or generation.